Do your children know how to cook? Let me start off by sharing that I think this picture is absolutely hysterical. I defnitely laughed out loud! I am so excited that more and more educational materials that are being created for us to teach our children how to cook according to the dietary principles we teach! We believe that kids will benefit greatly if they learn to cook earlier rather than later in life. Cooking can help children with math skills as they measure, learn about fractions, learn how to double a recipe or conversely how to reduce a recipe. Cooking develops fine motor skills as children cut and peel. They learn about the ingredients used in recipes. Reading recipes provides practice in phonics and comprehension. Cooking together, especially if you have more than one child, helps children learn to work cooperatively in a group. It can serve as an opportunity to experience the sense of satisfaction that comes from making a dish or a meal that will nourish us. Also, parents can benefit from the assistance of their children in the kitchen! Sous chef, anyone?! If we don’t teach our children to cook nourishing foods, who will? Sally Fallon Morell and Suzanne Gross, authors of the Nourishing Traditions Cookbook for Children, assert that learning how to cook is just as valuable in life as knowing how to read or write. Food is one of our basic needs. And the quality of our food has a profound impact on our health and ultimately, the quality of our life. Cooking is rarely taught in schools and even when it is, there are often compromises made regarding the quality of the food that we wouldn’t recommend. The authors also point out that children are more likely to eat food they’ve helped prepare. Cooking with children provides an opportunity to teach them which foods are healthy and why. It can spark questions about where our food comes from and how it is made. If you want your kids to learn how to cook and would enjoy some support, Katie Kimball at Kitchen Stewardship is offering a e-course called Kids Cook Real Food that I am excited to serve as a referral partner for. I actually think the course if worthwhile for adults learning how to cook for the first time as well! Katie is a trained teacher with four children of her own and has created an extensive curriculum complete with professionally produced videos, over 250 pages of .pdf lesson plans, five sets of printables and a 50-page recipe e-book. The full e-course includes 45 videos that cover over 30 basic cooking skills at three different levels: beginning, generally ages 2-5, intermediate which is age 6+ with beginner proficiency, and advanced, considered 8+ with intermediate mastery. The course includes all-kid-videos whereby Katie teaches a group of children together. There are 8 classes in each level. If you would like to see a preview of the class, view 3 videos that cover Knife Skills For Children for free until January 18, 2016. She reminds the adults not to forget to encourage and practice, practice, practice. It is abundantly clear to me that Katie is a former third grade teacher! She provides flash cards that succinctly summarizes a particular lesson, in addition to daily nugget cards such as “Don’t slip on skin”. She explains that there are lots of nutrients in and near the edible skins of many fruits and veggies – so if you don’t have to peel something, don’t do it! I find that Katie as very personable and authentic in the videos, speaking from first hand experience. I actually learned some kitchen skills myself watching the videos! Honestly, considering the amount of content that is offered, and how professionally it is created, I think this e-course is an incredible value. A bargain! You have the option to purchase a single level: beginner, intermediate or advanced for 29.95. Alternatively, you can purchase all levels for 59.95 – a savings of 29.90, which means you are essentially getting one level for free. Beginner lessons focus on small motor control, dexterity, and basic kitchen skills for ages 2-5. Intermediate lessons focus on recipe independence, intro to sharp knives and stovetop safety for age 6 +. Advanced lessons focus on sharp knife skills, oven safety and making meals independently for age 8+. Katie has generously offered our community one full course which includes all the levels, valued at 59.95. I will randomly pick one qualifying comment on January 17 at 6:00P Pacific. Enter in the comments with at least 5 sentences on why you’d like this course and/or why you think it is important that children learn how to cook. Note: at least 5 sentences. Be sure to include the name of the course: Kids Cook Real Food. Why do you think it is important that children learn how to cook? 49 Responses to Do your children know how to cook? My wish to be able to teach my kids with this course: kids cook real food is because I wasn’t taught how to cook at all as a child. When I moved out I had no clue and only one cookbook, which was from the diet dictocrat area, as my mother fully subscribed to that. It took me many, many years to learn the right way of making food. Now I’m at a place where I want to make sure my children learn to cook nourishing foods so that they don’t have to go through the struggles I did. Life is just to short to start wrong and have a search for years to find out what is nourishing food. I would incorporate this course into our home education journey. I wasn’t taught how to cook as a child either, even though my mother wrote a cookbook and served as a caterer for a period of time! I think it is a critical life skill! Kids Cook Real Food would be perfect for my 4 year old daughter. She’s been at my side, daily cooking on her own safety stool since she was 14 months old. I’m new to the traditional “nourishing foods” as I discovered them less than a year ago. I definitely see the difference her participation in our cooking increasing her enthusiasm for the healthy foods. 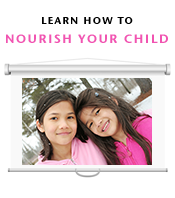 With the guidance of this course, I can teach my daughter, as well as myself, the art of healing our bodies through the yummy healthy foods we eat. I truly look forward to this information eagerly! I love the course, Pam, which is why I’ve chosen to promote it. I wish I could give it away to each respondent! I was inspired to read that your daughter has been part of your daily cooking since 14 months! I believe that will influence her experience of food as she grows up! I’m a single mom working outside the home who still insists on real food, cooking from scratch and eating together. I could really use my six year old daughter’s help in the kitchen when we get home. She is ready to contribute, even wants to – I just don’t know the first thing about teaching her and perhaps I’d have more patience if I knew how to begin. I also believe children are more interested in eating what they have helped prepare – and it will help her understand and appreciate the energy that goes into our meals. My hope for her is that she learns to be self-sufficient preparing wholesome meals now, so that when she is out on her own someday she can nourish her body – unlike me who spent the first many years of my young adulthood depending on spaghetti and frozen yogurt. Four years ago we had a food revolution in our house! Now we belong to several CSAs and follow Dr. Weston Price. But cooking prowess? I’ll probably be learning right alongside her, lol. Taj, having reviewed the course, and reading your words, I think this may really work well for your needs! This is fantastic! I would love to have the course Kids Cook Real Food! I have 3 kids that would benefit from learning the skills in the course. It would be nice for them to learn ways to help in the kitchen. But more so, I think it will be awesome for them to have that foundation for the rest of their lives, and confidence to cook for themselves. So when they are on their own, they don’t resort to fast food, they aren’t scared to get in the kitchen! I would love to win Kids Cook Real Food course! I have 5 children, and I would love to teach all of them to cook. I am not always the best cook myself so I am sure I can also learn from Kids Cook Real Food. Also, we are trying to eat more Real food in our home so a class that teaches how to cook it would be highly beneficial! I am definately checking out the Free Knife Skills Lessons because my kids are scared of knives! I have only let them cut once or twice and they need to get over that fear! Thank you so much for these classes! Shannon, I am watching the series and learning some tips myself! Let me know what you think of the knife series! This course looks awesome! I will check out the knife skills this weekend. My children are good eaters, but they are not very adventurous with new foods. By teaching them to cook and handle the foods on their own, it will get them more involved and interested in different foods. I believe that with any experience, kids can learn more by doing. Also, kids love experiments and cooking is the ultimate experiment of pairing different flavors and foods together to make something great. Thanks for the opportunity to learn some new skills. I would love to have Kids Cook Real Food! I think it is so important for children to learn how to cook while they are young. Usually, they have a strong interest in cooking then, which seems to wane as they get older. Teach them the skills while they are young, and they will be better able to prepare food and know what to do with it when they are older! My kids are so into cooking, but its hard for me to not try to get it all done as quickly as possible and just slow down to teach them. I think this would help with that a lot. I would love to have the Kids Cook Real Food to use with my 3.5-yr-old son. He loves to watch me and to help in the kitchen, but I don’t always feel confident that I know the correct/safe way to teach him, or to find the balance where I’m allowing him enough independence but not putting him in harm’s way by letting him do something he’s not ready for. So it would be great to have it all laid out in terms of what is appropriate at what age, what is a good sequence for teaching the skills, etc. It is immensely important to me that my child learn to cook real food so that he will enter adulthood ready to care for himself and his family and not suffer the ill effects that are, well, standard with the standard American diet. I have had health struggles of my own and have had to learn as an adult how to turn my diet around. I’d love for him to learn how to choose and prepare nourishing food much earlier in life than I did! I constantly see children talking about going to fast food establishments, field trips with lunch (fried food and Sprite) included, and other sad examples of children continually eating that which can’t nourish and establishing that as their “norm” that will carry them into adulthood. I want something better for my child and am determined to do what I can to make that happen. As a former cake decorator, I’ve spent many hours shooing my kids out of the kitchen. My children want to learn how to cook, but I’m not a great teacher. I’ve always found that it’s easier to do things myself. I can do them faster and better (I’m a recovering perfectionist). I know this is a dis-service to my children and that cooking skills are some of the most important things they can learn in this life. I would love to win the Kids Cook Real Food eCourse so that I can learn how to teach my kids the life-changing all-important skills presented in this class…and they can fulfill their desire to learn to cook for themselves. I know that all of us could benefit from eating healthy, real food…and that my kids would eat it if they cooked it themselves! As a mother who has watched my daughter heal major gut issues through real food and who myself is healing through real food I know how life changing cooking with real food can be. I also know how much commitment it takes living in a fast food society. I would love for my children to be able to take the Kids Cook Real Food course so they can learn about traditional cooking from someone besides their mother. I love cooking with them and sharing new things but many times it takes the influence of another person to really excite them. In an age when so many folks are still following the standard American diet I feel like more than ever my kids need to learn these skills early so they will be fully prepared by the time they leave home. I think the Kids Cook Real Food Course would be a fantastic resource. I have 3 children (thus far) and we grow our own food, which I am slowly teaching them by giving them the seeds and letting them “do it themselves”; however, I am truly TERRIBLE at letting them loose in the kitchen. I was never taught to cook, my mother (poor soul) cannot cook anything that doesn’t come out of a box and even then it’s iffy. I learned to cook on my own and it wasn’t until 5 years ago that I began researching traditional cooking, so a lot of the techniques are still new to me. My oldest, 5, desperately wants to cook beside me, and I’d LOVE to know HOW to teach her, HOW to explain things to her that she can easily understand. Too often she tells me, “Mommy, your words are too big”…haha. It is so important to me that they not only find themselves comfortable in the kitchen, but that they have the skills that enable them to cook traditional meals to nourish their families in the future. One of my enduring memories was junior high cooking class with my brother. Being latch key kids we would come home and cook together. While our single mom worked we cooked and baked. To this day both of us enjoy cooking healthy yummy food. It was so empowering to know how to sustain ourselves at a very basic level. My 6 year old twins now want to cook with me and are begging for a cooking class. Kids Cook Real Food seems a perfect way to support them in their desire from a health perspective that I agree with innately. Kids Cook Real Food is a Godsend! With the toxic chemical concoctions passing for for food these days knowing how to cook is the first line of healthy eating self defense. Kids who have these skills will have a head start on a lifetime of nutritional eating. This is a skillset that will contribute not only to them but their entire (present and future) families! Thanks for the investment, kids who can cook won’t be at the mercy of the processed food industry. Hi! Cooking nourishing foods is important. I am a mother of five children, ten and under, and my eight year old has always been interested in cooking. It would be a blessing to have a young chef in the kitchen cooking for me😊. It’s hard to get traditional, nourishing meals on the table when you haven’t prepared and when the kids are very hungry right then. Winning your cooking lessons would be something entertaining, informative, and insightful to watch as a family to help gear us up for healthier meals. I am a speech/language pathologist and and I see, everyday, the devastating impact of food choices on the accessing the ability to learn. I would love to incorporate traditional nourishing recipes in my language curriculum so that the children and their families can learn through first hand experience the power of food in healing. I think that if I can show them along with teaching them with hands on lessons, they will learn and feel the amazing benefits of a nutrient dense diet. I was never taught to cook, so when I was on my own, then with a husband and then children, it was boxed meals and spaghetti sauce out of a jar. When my youngest son came along with multiple food allergies, life as I knew it (in the kitchen and grocery store, at least) came to a screaming halt. I had to learn how to cook from scratch! I would love for my kids to take Kids Cook Real Food. Because this process has been a bit of a struggle for me, I have a hard time including my children in the cooking, and it would be great for them to learn from someone who is proficient. I’m sure I would learn a lot, too! Hello, I would love to be able to share this course, “Kids Cook Real Food”, with my 6 year old niece. She loves to help her grandmother in the kitchen with baking projects, and this cooking series looks like it would provide more ideas and tips for all of us. My niece is starting to become aware of what foods are best for her and that the sugary, processed ones make her feel sick. This cooking series would further encourage her to make healthy choices and that they can be tasty and fun to prepare! Giving kids that connection to real food, where it comes from, and how to work with it is an invaluable relationship and skill for a happy and healthy lifetime. Thank you! My kids were given the “Nourishing Traditions for Children” book and they were delighted. They feel so accomplished when the make something, and they know I cook differently from their friends’ parents. This course will give children the skills they need to conquer basic traditionally cooking, skills that have been lost for two generations. If we are to have a healthy human future, we need great farmers and cooks to be strong to face the challenges of our world. My mother taught me how to cook and sew at the age of 8. Now the mother of 3, ages 2, 4, 7, they always what to help me cook meals. I feel they are too young, but husband doesn’t. I would love this course so I can properly teach my children not only how to cook but kitchen safety as well. They are very self sufficient children and I know these skills will only better them for life. My mom did a fairly good job teaching me to cook as a child. I learned at a young age how to follow a recipe, and we made a majority of our meals from scratch. Most of our food came from our deep freezer: my grandpa raised cattle, so we always had beef on hand, and we froze a lot of vegetables from our garden. Boxed mixes were kept on hand only so my dad could prepare a meal if my mom was gone or got sick. I didn’t think much of it until I got to college and realized that most of my friends had no clue how to prepare meals, let alone pie crust or bread, from scratch. However, I was not introduced to true traditional methods of cooking (ala Nourishing Traditions) until my daughter developed food allergies at a young age. I want my 7 year old to know her way around the kitchen so she is prepared to be self-sufficient and equipped to make wise nutritional choices. I think the Kids Cook Real Food course would help her understand why we don’t each the junk her friends do and empower her to be more independent in the kitchen. I have an interest in the Kids Cook Real Food course for my three children. It is a daily struggle to get them to choose the right foods. Every mother wants what is best for their children. We all now know real food, cooking at home, eating with family are some of the most important things for our health. My hope is that this course will drive this message home to my kids! Although my mother always cooked at home for her 9 children and our father, she never took the time to teach us these skills. I picked up a few things along the way, especially later, but never really learned enough to want to cook good food for myself. I need Kids Cook Real Food as much as my children do so I can fill in the gaps of my knowledge. I have a difficult time knowing what tasks to give my children when working on meals, and we often get exasperated and give up. I’ve been searching for something like this to incorporate into our homeschool curriculum—perfect timing! I took a look at the Kids Cook Real Food knife skills preview, and I am drooling! I took a professional knife skills class in my late thirties, and it wasn’t until then that I felt comfortable with scratch-cooking. Now that I have two children, and I want them to have real food experience from early on, I find myself shivering at the thought of handing them a sharp knife! Katie makes everything so simple and clear, and enables me to teach without having to rethink everything I know down to the most basic level (which of course I’ve never taken the time to do). Also, I feel in my heart that involving children in household routines is an important part of building esteem. YET, like Katie mentions in the preview series, I find myself letting them play, not wanting to interrupt, and especially not for “time for cooking” which may lead to whining or resistance that I’m not wanting to deal with. Her idea to turn it into a scheduled “lesson” that they can anticipate and look forward to is just absolutely brilliant and so incredibly inspiring!! The Kids Cook Real Food ecourse is a do-able method which is also an investment in the future–not only in their overall attitudes about food, but also in their esteem (being a capable part of the family teamwork), and furthermore, in their ideas about family roles in the kitchen–that it can be about working together, and not about waiting until Mom makes the meal. I’m incredibly inspired and hope I can begin soon!!! I think Kids Cook Real Food would be a great way to get my 7-year-old daughter into the kitchen more! It’s so important for kids to learn to cook from scratch. It gives them confidence. It gives their palettes a chance to experience and savor real food so that boxed/processed food will be a poor substitute (despite their convenience) as they get older and become more independent. It helps them learn about ingredients and the importance of quality. We religiously shop at our local farmer’s market each week, and getting my daughter into the kitchen more would complete the cycle and help her understand where our food comes from and how to use it. I cook from scratch often, but I’m not really sure how to engage her in the kitchen more. I feel like Kids Cook Real Food would help where I’m lacking! Kids cook real food! Real kids cook real food! My 6yr old Jarrett loves to help out in the kitchen. For the past year I’ve been letting him cook certain foods. Jarrett has become a little chef, I would like to find more kid friendly recipes so I can feel tad bit more comfortable with him In the kitchen. I noticed while reading about Kids cook real food there is a part about proper knife handling and even more helpful tips, recipes that would be perfect for my little guy! Even if I didn’t win I still see myself spending some money on Kids cook real food it seems worth it in my book. I have foster kids whose lifeskills education has been neglected. We are currently working hard to teach the simplest skills that we have instilled in our biological children since birth. We started with building muscle tone and balance so that they can properly hold silverware. Now, we are ready to move forward and teach them to cook meals and eat a diet that will keep the balance in their gut bacter. I would love for my two daughters to learn to cook real food and the Kids Cook Real Food would be a great way for them to learn and for me to teach them! I find that I have a hard time teaching them as I probably don’t have good enough skills or use them properly as I was never taught to cook. I would find the course a good way for me to learn how to teach them properly and more easily. It will also be great to have them help more in the kitchen, and even start to prepare some meals themselves. The course could also become a great addition to our homeschooling activities. Even if i don’t win I will seriously think about investing in the course. What a brilliant idea to create a course for kids! As a mom of 3 (8, 4 and 1), Kids Cook Real Food is exactly what I need! I grew up in a family that not only didn’t teach me any cooking skills, but really didn’t cook. We lived on fast food, and as a result I was constantly sick. As a teenager, I was plagued with more illness and infection that a person should experience their whole life. My eyes were opened by two college roomates, and I have since devoted my life to healing through real, whole foods. I spend so much time in the kitchen, and I see my children wanting to help, and while I let them help with small things like measuring and pouring, I’ve never felt confident to give them bigger tasks. I remember feeling so daunted by cooking in my early 20’s, that I can’t wrap my head around my 8 year old being able to use sharp knives and cook on the stove! But I want this for him. And I see that he wants it as well. And if I could get my 1 and 4 year olds started now, wow! I can’t even imagine how awesome that could be for all of us. Sure I’m teaching them a lot about why the food we eat is good for our bodies and minds, but I am clearly missing out on a great opportunity to empower them, to bond with them and to inspire an even deeper love for the amazing food we nourish ourselves with. Kids Cook Real Food would be such a benefit in our home! We have only recently begun to enjoy new foods prepared at home using the Nourishing Traditions cookbook. As a family with nine (9) kids aged 3 through 16, we rely upon each other to prepare, serve and clean up meals each day. Our three eldest are capable meal preparers (read: chefs) while Mom and Dad are often away at work before dinnertime. Kids Cook Real Food would fill quite a need here as I want them all to learn to prepare traditional foods, not to cut themselves (!) in the process, and experiment with new foods we have never tasted! And, oh, if only we could enjoy eggs without the shells cooked into the mix!! The Kids Cook Real Food program looks fantastic! I really connected with what Katie Kimball said in her introductory video and info page regarding the difficulty of making time to invite kids into the kitchen to help. The extra time and extra mess involved is a huge obstacle. Using this program would help me to look beyond the initial difficulty to the enormous long term benefits of having my children grow up cooking food for themselves and our family. And, the thought of passing off some of the cooking responsibility earlier than later does sound very very nice! From what it sounds like, using the Kids Cook Real Food program, the whole process of demonstrating and learning how to cook will go a lot more quickly than I think. Having a program to follow will also take away the mental prep I need to put into coming up with ideas and recipes for my children. It looks like a fantastic way to get kids excited about helping in the kitchen! My 5 year old loves to cook. He helps me with every meal and has a few things he can prepare on his own. I want taught to cook until I met my husband in college and am thrilled to be starting my son off from the start. I would be thrilled to have the Kids Cook Real Food program for him to be and to learn and explore more age appropriate cooking with him! Begging. Pleading. Striving for independence. Searching for significance in the work of life, rich with meaning; not yet dulled as a knife with mundane repetition or squeezed as a lemon in the pressure of time. His life depends on it. Kids (can) Cook Real Food. Generations of boys turned men before him. Bachelors, divorces, and widowers stumbled, falling into fast food addictions; eating to their early demise, disabling chronic health conditions, and untimely death. Help me to help my son adventure into enticing aromas and flavors, nourishing the body, satisfying the soul, enriching his life and the lives of others with the blessing of cooking; giving a toast to life and all that sustains it. My kids (age 7 and 9) and I would love the Kids cook real food program. We keep failing at following nourishing food traditions because we opt for simple meals. With busy school, extra curricular and work schedules, we have not been spending enough time in the kitchen together. When I do spend time preparing meals, it is rarely with their help. They love to help bake on occasion though, and when I mentioned this opportunity, my 9 year old daughter jumped for joy. I am an acupuncturist and I teach a college nutrition class, so I value nourishing traditions and sharing those with others. I need to spend more time sharing these things with my own children. I got around to watching the free videos just under the wire …. what a great series! Kids Cook Real Food is a gem. My son (age 10) happened to walk in when I was watching the video and asked me if we can do the course together. I’m going through some of the principles of Nourishing Traditions with my middle daughter (age 16) and one of her friends now and I’m excited to think my son has an interest in learning too. Katie from Kids Cook Real Food is very personable, engaging and puts concepts and ideas into language that little ones not only understand but embrace. Once upon a time children were taught to cook at home. But somehow in the last generation or two it has become more of a lost art. If we want the next generation to be healthy, it’s important that we teach them at a young age to eat real food and how to prepare it. My son loves to cook and bake. He takes culinary classes over the summer at a local sports camp for kids, and he has been in the kitchen since he was on the hip of my mother or me shortly after birth, and he has loved every minute of it. Having access to learning culinary skills via Kids Cook Real Food by Morell and Gross throughout the year will further enhance the skills that he has already learned and will add to his solid foundation of cooking and baking. While culinary skills are very important to everyone and should be taught starting at a very young age (in my opinion) they are even more so important to someone that sees to be vigilant about diet and nutrition. My son is gluten free, casein free, soy free and avoids anything artificial. He was diagnosed with Autism at a young age, and maintaining a healthy diet has resulted in huge gains and lots of healing. He must know how to cook in order to further heal and maintain a healthy lifestyle that won’t be detrimental to his body and mind. I would love to use this course over the summer when I have my three kids at home with me all day. I have done bits and pieces of cooking with them, three very different ages, but it would be SO helpful to have something organized. My oldest is ready for making meals on his own, but I’m not sure what next steps to take with him. My middle child is “right there” with some of the middle level class skills but needs much more confidence – and he’d be much happier about learning from a video than his mom. I’m particularly happy to see the very youngest category. Certainly, I have my toddler in the kitchen with me all the time in his learning tower. But, he would LOVE to “own” a certain set of skills that he knows he is in charge of. I definitely need more ideas of what to teach him. Great idea for a course! I had seen this advertised before, but your post had hooked me. Boo! Just saw the date and it was last year. :( So, I guess I missed it by a year. lol. Oh well, I guess I will be investing in this soon!